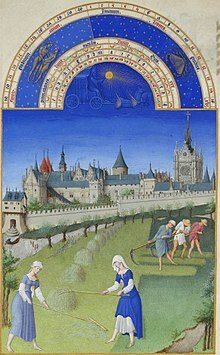 An t-Ògmhios, Les Très Riches Heures du duc de Berry, Chantilly. 'S e an t-Ògmhios neo Meadhan-Samhraidh an siathamh mìos sa bhliadhna. Tha 30 latha sa mhìos. Air a tharraing à "https://gd.wikipedia.org/w/index.php?title=An_t-Ògmhios&oldid=521896"
Chaidh an duilleag seo a dheasachadh 4 dhen t-Sultain 2016 aig 11:26 turas mu dheireadh.